‘David’ is a wonderful historical novel which powerfully evokes another time and place. More than that, the fascinating details of renaissance Florence provide a vivid backdrop to an exciting personal drama. What more can you want from a novel? And in our fame obsessed time it is particularly clever to focus on one of the most well known faces in western art and to tell the story of the unknown man behind the image: Gabriele, the model for the famous giant statue of ‘David’. In this story the iconic face and body of the shepherd boy who felled Goliath are those of a humble stone cutter, the ‘milk brother’ of the sculptor, Michelangelo. The novel is very much Gabriele’s story simply and economically told from the vantage point of his old age. He recalls the glory of his youth and the dangerously turbulent politics of the time and, as a guide to his own past, is able to make the complex factionalism of his youth comprehensible to the reader. This is no mean feat and one of the great strengths of the story that the reader learns the secrets of the city along with the young Gabriele, the handsome innocent from the country. On his first night in Florence Gabriele is mugged by thugs and then seduced by his rescuer, a wealthy widow, Clarice de Buonovicini. He fathers a son, whom she passes off as the child of her new husband, Antonella de’ Altobiondi, leader of the compagnacci. This group support the reinstatement of the banished Medici ruling elite and Gabriele himself finds himself using these connections to spy for the opposing faction, the republicans, for whom Michaelangelo’s ‘David’, is a political symbol as much as a work of art. When the true paternity of Clarice’s child is revealed and the pro republican statue is unveiled riots erupt on the streets and Gabriele and the statue are both in terrible danger. As we all know, ‘David’ the statue survives but what of Gabriele the man who is blamed for the murder of Altobiondi? How can the best known face in Florence escape the city unseen? The answer provides a radical solution for those who come face to face with the downside of fame. Maybe David Beckham et al could take note. 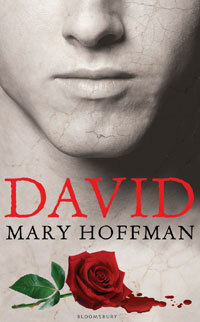 'David' sounds wonderful and I'm hoping to read it very soon. I predict that this novel will be a stratospheric hit. It has the explosive mix of a wonderful author and a brilliant idea. Sorry - coming to this very late after a holiday during which I read Mary's gripping full-of-intrigue tale. I loved it! I learned a lot about the history of the period, and Florence is definitely top of my list of soon-to-be-visited European cities so that I can see 'David' for myself.